As much as you love your dog, there’s no denying he’s an expensive addition to the family. If your pet care budget is tighter than the collar around Fido’s neck, take a look at these cost-saving tips. The following guide is guaranteed to save you some cash so you can spoil your four-legged friend. Some think they need a husky because of how much they resemble Game of Thrones direwolves. Some – after following Doug The Pug for years – think they could only own a pug. Dog breeding is one way these people get the purebred they want, but they end up paying for it. Depending on the breed, you could be spending anywhere between $500 and $1,000 just ensure your dog is of a certain pedigree. Then you have to cover the cost of their vaccinations, de-worming, and fixing. That’s in addition to the fortune you’ll spend on their ongoing care. Purebred pedigrees are often inbred, and their limited family trees can affect their health long-term. According to Sainsbury’s Bank, most pedigree owners end up spending a third more in vet bills each year than those who own mutts.Adoption, on the other hand, is much cheaper. It all depends on the shelter or organization you adopt through, but you shouldn’t expect to pay more than $300 in adoption fees. This fee covers a vet check, shots, fixing, micro-chipping, and de-worming. It will be harder to find that must-have breed in the shelter, but adopting a mutt will save your wallet and your dog a lot of problems down the line. It’s also a good deed, as it gives a second chance to dogs left behind. Fido can do no wrong — until he gnaws on the furniture, pees in your shoes, and does damage to your rental apartment. He may be your best friend, but he can be a monster to your property. Don’t resolve yourself to a life losing out on your security deposits. Put your dog into training and teach them this sort of behavior is unacceptable. Most pet stores offer classes, and a quick Google search will bring up any local private academies. Don’t worry if you can’t afford these professional classes. YouTube is a great resource for those on a budget. You can find professionals who share reliable tips and tricks for the most common issues faced by pet owners like you. While you can skip class and check in online to save some cash, you can’t exactly miss out on the vet. To do so in your pet’s time of need could put their life on the line. Unfortunately, a sick dog can come with a huge bill you aren’t prepared to tackle just yet. Personal loans are a great way to bridge the gap between your paycheck and the vet’s bill — especially if you secure one from a direct online lender. 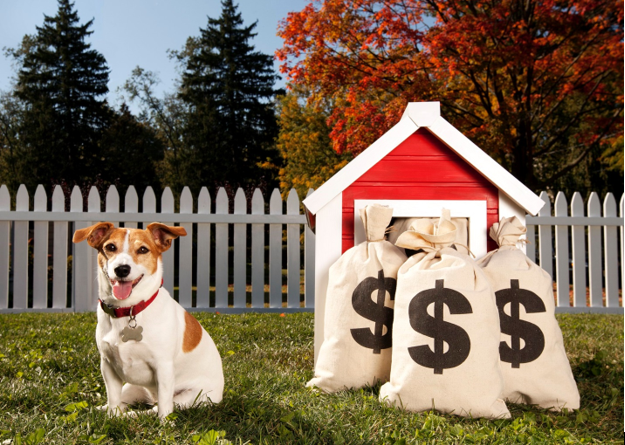 Many installment loans online are quick and convenient to secure, so you won’t have to waste any time waiting before you can save your pooch. In the case of a lender like MoneyKey, you’ll usually receive your advance within a business day, making it easy to get an online loan quickly. You know buying in bulk doesn’t always work in your favor. Proof of that is in your kitchen cupboards after a trip to Costco, now stocked with four multi-packs of candy bars your waistline doesn’t need. When it comes to dog food, on the other hand, buying that bigger bag of kibble or multi-pack of canned wet food can shave off a few dollars from your receipt. Be careful, though. The cost-per-item of bulk food isn’t always priced lower than their regular counterparts. Do the math and see which brand and store offers the most food for the least amount of money. Owning a pet is a financial commitment that can be at odds with your budget. Luckily, you can keep costs low by trying these cash-saving tips. They’re an easy way to keep both Fido and your bank account happy.